PUEBLO GRANDE MUSEUM BLOG: What's the Story? Hosted over 19 – 25 June, #MuseumWeek is an international online event celebrating and showcasing all things from cultural institutions over 7 days, 7 themes, 7 hashtags! It will provide an opportunity for them to share and discuss their special passions with the public on social networks, using hashtags dedicated to the event. Today's theme for Wednesday, June 22, 2017 is stories. And when PGM staff got to thinking about this theme, our Curator of Collections Lindsey Vogel-Teeter, came up with the idea of an object whose story is unknown. And all the crazy ideas, backstories, and theories that go along or evolve from them. 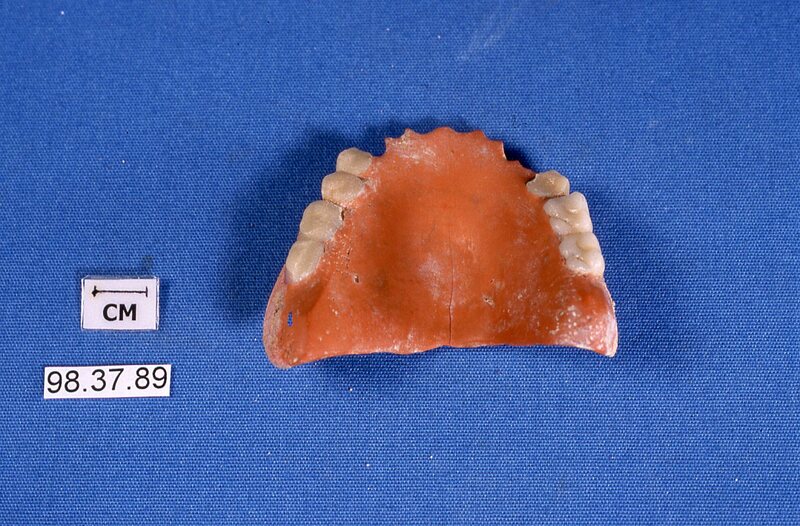 Lindsey then shared this object from our collection: 1998.37.89. Because it always makes her think... what is its story? 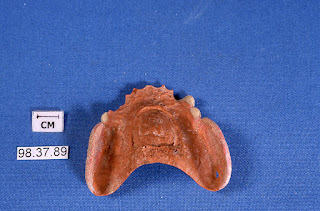 It’s a partial dental plate (partial dentures) that was found in a privy (outhouse) during excavations in downtown Phoenix, prior to the construction of the Sandra Day O'Connor U.S. Courthouse. Previously, the area where the dental plate was found was owned by the Dorris family. Mrs. Sally Dorris ran a boardinghouse and Mr. J.W. Dorris began as a confectioner but later went into the grocery and wholesale business. The privy was filled between 1900 and 1910. 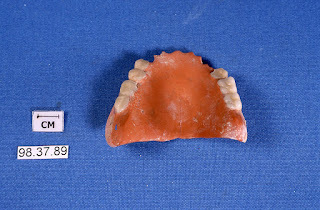 Here’s my question – How did these dentures end up in an outhouse? Did they fall in by accident or was it on purpose? Dentures are expensive and these are really worn down, so someone must have missed them. Did they belong to someone in the Dorris family? Or maybe a boarder? There’s really no way to know. What's the true story of these dentures... only the outhouse is privy to the truth!